Order now and receive free freight! Every Large Diameter Tapcon is in stock for immediate shipping. 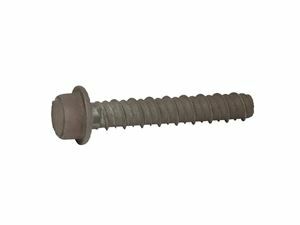 The Zinc Large Diameter Tapcon (LDT) anchor, a high performance anchor with a finished hex head, is removable and self-threading. It is manufactured from 410 stainless steel or grade 5 carbon steel that is first hardened and then zinc plated to provide additional rust resistance. This simple-to-use anchor works by drilling a hole in the concrete using an ANSI B212 15-1994 standard bit and then driving the Zinc Large Diameter Tapcon by hand or by impact. 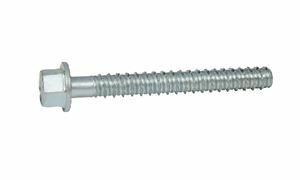 The application is done in half the time of an adhesive type of concrete fastener. The special Sawtooth™ thread design provides improved performance in larger diameter holes required for the LDT, which saves time and money. The hex washer head has anti- rotation serrations to prevent the anchor from backing out once it is properly installed. Each head of the Zinc Large Diameter Tapcon is stamped with a length identification code that allows inspectors to determine the embedment depth of the anchor. The Zinc Large Diameter Tapcon is sold complete and ready to install without the need to assemble nuts and washers. Large Diameter Tapcons are from 3/8" in diameter to 3/4" in diameter, and are so designated because they are larger than the original blue Tapcons® are manufactured in 3/16" and 1/4" diameter. Product List - go the complete product list of Large Diameter Tapcon and simply click on an item. This will link to the individual product page for that item. Complete information relating to the specific item is described to provide assistance in the decision-making process. Technical Information - click on the link and go directly to the page that has all the holding values, technical specifications, and other important information. Installations -for visual and written directions that explain how to install the Large Diameter Tapcon, visit this page to view a video and read step-by-step instructions.